This is probably the most delicious wrap I have ever eaten. I was so in love with my Clean Eating Pineapple Salsa that I made another batch to try with some goats cheese. Oh.my.word it was amazing! 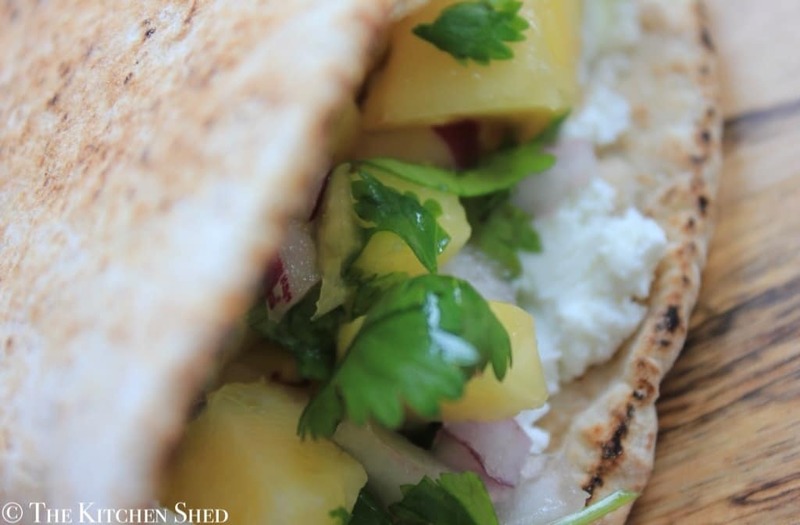 The pineapple salsa was sharp and juicy against the cool creamy goats cheese Mmmmmmm…. A match made in heaven! No one else in my family eats goats cheese, so you have GOT to try this and share the excitement with me!! 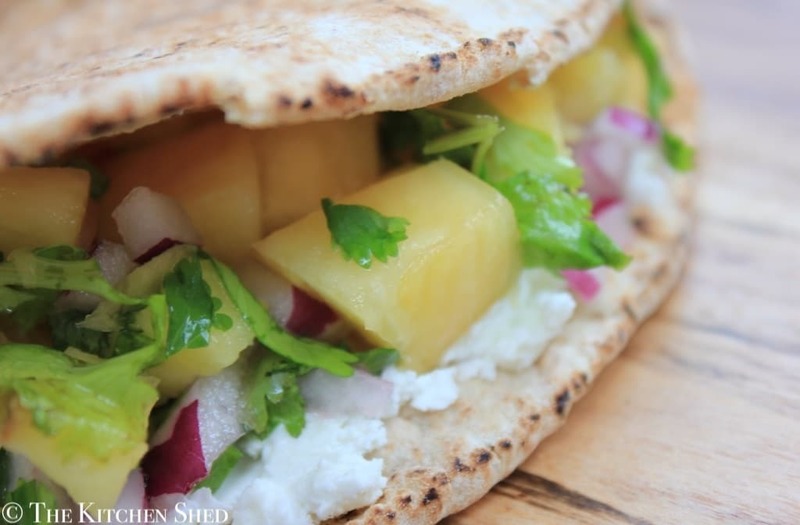 Clean Eating Goats Cheese Pineapple Salsa Wrap is amazing. It is a great way to use up any leftover pineapple salsa but like me, you might want to make up a batch just to try this out. If you can’t find a clean wrap/flat bread you can make your own: Clean Eating Indian Chapattis or you can just turn it into a sandwich with some wholemeal bread. It also tastes great on a oat cake (as seen in the middle photo). You can serve it as a Clean Eating Appetizer at a dinner party. Clean Eating Goats Cheese Pineapple Salsa Wrap is amazing. It is a great way to use up any leftover pineapple salsa but like me, you might just want to make up a batch just to try this out. Spread the goats cheese over one half of the flat bread. 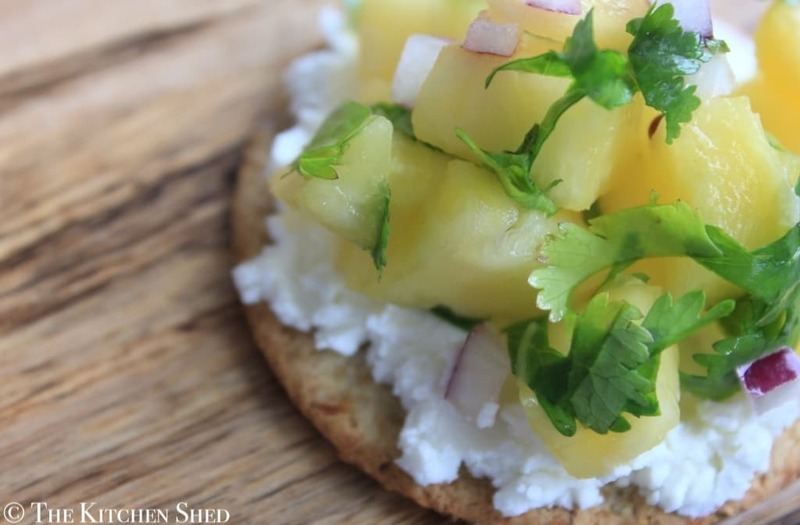 Top the goats cheese with the clean eating pineapple salsa.